As I said in my last blog post, IoT really is changing everything. One area where we’re seeing a tremendous impact is power distribution for buildings. Thanks to innovative technologies, buildings can radically improve performance, safety, efficiency, and sustainability. At Schneider, we’re committed to making sure that every building owner and operator of small and medium facilities can take full advantage of IoT and power advancements with EcoStruxure™ Power. Where do I start? Well that’s easy — it all starts with connectivity. There’s a simple reason why we call our panels “smart panels.” They let your whole electrical system “talk” to you intelligently. Before digitized power, you may have had an alarm go off without knowing what to do about it and where to go to address it. Now real-time text messages can flag precise overloads and efficiencies, enabling you to make informed safety and operational decisions quickly. No one should have to chase vague alarms anymore. With connected breakers and smart alarms, you can verify the status and immediately know the root cause of the trip — whether it’s a pinched wire, overload situation, etc. From there, step-by-step information on your phone shows you how to fix a trip safely. Before digitized power, you were in the dark — literally and figuratively. Powerful connectivity like this opens up unprecedented control thanks to mobile solutions. Take the bakery Maison Manival in Grenoble, France, for example. 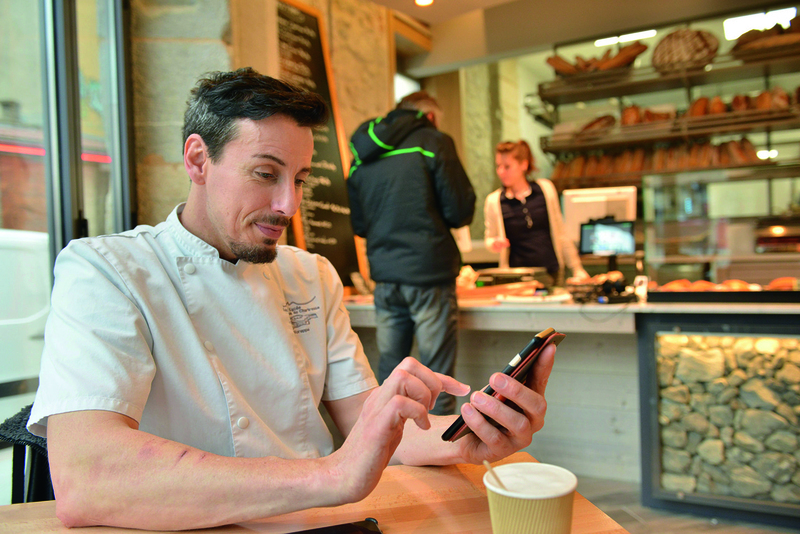 Maison Manival’s old-world tradition transformed when its classic baking approach met Schneider connectivity. A digital power distribution infrastructure protects its ovens and refrigerators, which are integral to its daily operations. A simple app can alert the owner, Stéphane Massonat, at any time if equipment failure does happen. He can call in assistance right away or remotely resolve the issue. Now Massonat can get back to his hobby of hiking in the heart of the French Alps while still running his successful artisanal bakery. Not only does day-to-day operation improve; digitized power distribution changes everything about maintenance, improving a building’s long-term health. As a company, Schneider is overhauling the way facility owners and managers perform maintenance in small and medium buildings. We have connectivity and predictive analytics on our side here. Arbitrary, time-driven maintenance schedules have fallen by the wayside. By contrast, condition-based maintenance improves reliability and lets you take corrective actions quickly when risks appear or outages occur. For example, if a motor in the HVAC system is running hot, you can address it before it fails. EcoStruxure Facility Expert notifies you in real-time, anytime, anywhere. EcoStruxure Facility Advisor leverages intelligent power metering and predictive analytics to provide this capability, taking building operations and performance to a new level. For Schneider, our partner ecosystem of system integrators, installers, and building EcoXperts is key. We cultivate collaboration and innovation across this network. This approach is cost-effective for customers, and it aligns them with local players to build trusted partnerships. Our partner value chain helps small and medium building owners from installation to power management and upgrades. Watch, for instance, how our partners helped Nemours Children’s Hospital integrate EcoStruxure solutions to optimize efficiency and operations. It’s clear that power distribution in buildings of all types and sizes is undergoing a fundamental and irreversible change. As technology leaders in the IoT realm, we’re happy to disrupt the traditional linear path from plant to plug in favor of a digitized IoT delivery model that’s so much more efficient and responsive to real-time events than we could even imagine in the past. We’ve been in power distribution for 50 years. We welcome the next 50 as we continue to help our customers thrive in the digital world. Learn more about EcoStruxure Power.